You are here: Home / Social Media / Let’s Talk Twitter: Stop Tweeting Boring Sh*t! Let’s Talk Twitter: Stop Tweeting Boring Sh*t! As you may have noticed by now, the social media world never sleeps. Hope you have a coffee machine or energy drink nearby to keep up with the updates! With continuous updates lately, Facebook has been in the spotlight for all news related to social media. Today we’re going to switch gears and put the spotlight on Twitter and discuss the new profile design, the mute button feature and why you should stay active on the platform. • Best Tweets – Your tweets that receive the most engagement will appear larger in font size. This will allow followers to find your best content. • Pinned Tweets – Have something important to share with your followers? You can now pin tweets to the top of your profile to increase their lifetime. • Filter Tweets – Tired of reading a brand’s cheesy replies to customers? You can now filter tweets by the following: Tweets, Tweets with photos/videos, or Tweets and replies. • Larger Twitter Header Photo and Profile Picture – This allows you to show off your creativity. Over the past few weeks a number of Twitter users are being prompted to upgrade to the new design. While the new profile has many new features, the switch to the new design is a piece of cake. However, designers may want to take another look at Twitter profile and header photos. For the new Twitter profile, the recommended dimensions for the header photo are 1500×500 pixels. With an increase in size for profile pictures, it’s also a good idea to make sure your display picture is at least 400×400 pixels. One of our favorite books is Stop Tweeting Boring Sh*t by the Division of Labor. Yes, this is one of the books you can judge by the cover – just please, PLEASE, stop tweeting things that nobody cares about. Any avid Twitter user knows how quick a tweet can move through the timeline, so it’s hard enough to get your followers attention as it is. Well, now that Twitter is introducing the mute button, you might be in the danger zone if you’re still tweeting things that nobody cares about. 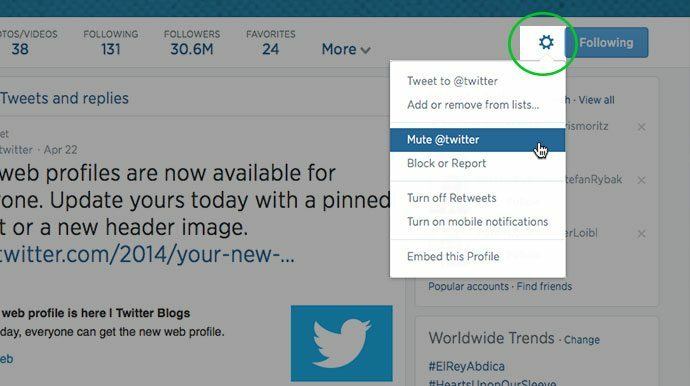 The new mute button, which is a feature Twitter has started to roll out to iPhone, Android and Twitter.com users, allows Twitter users to take advantage of spring cleaning and silence other tweeters. You could be silenced if you tweet too much, tweet in a spammy manner, or just become unwanted on a Twitter timeline. It’s the friendly SHUT UP button that keeps you silent – without you even knowing. So what does this mean for your brand on Twitter? Continue to be creative and create content that your community wants to read and engage with. Listen to your community for topics to talk about, rather than forcing them to listen to you. While many of us jump right to Facebook for social media, it’s important to keep Twitter in your social media efforts. Twitter has a whopping 241 million active users each month. More than half of those users, 184 million to be exact, are using Twitter on their mobile devices. Twitter still remains one of the largest social networks on the web. Now it’s time to update your profile to the new design, clean up your newsfeed with the new mute button, and STOP TWEETING BORING SH*T!